Find, read, listen and view poetry. Search for a poem in poetry.org, poets.org, poetryfoundation.org, poetryoutloud.org and more. 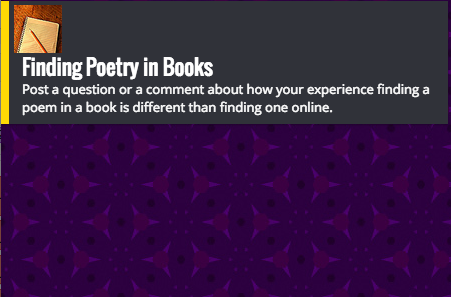 How is finding poetry in books different from searching online? Watch videos of Americans reciting favorite poems. Watch performances, listen to podcasts, or find a poem at Poetry Out Loud.